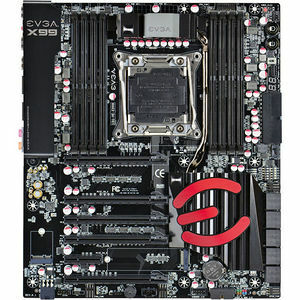 The EVGA X99 Classified was engineered from the ground up to be the best overclocking motherboard on the planet. It all starts with power. Dual 8pin CPU power inputs provide up to 600W of dedicated power for the CPU, along with a highly efficient 10-phase Digital VRM providing the cleanest power to the CPU possible, fed through a CPU socket that has 1.5X the amount of gold content. A total of 8 DIMM slots support up to 128GB of DDR4 memory, and a 4 layer memory T-routing design allows for extreme memory speeds such as 3000MHz+ (OC). The PCI-E layout is optimized for improved lane distribution and better performance, and with native support for NVIDIA 4-Way SLI, this is the ultimate platform for the enthusiast. A great amount of detail was also paid attention to the onboard devices, including a total of 10 native SATA 6.0Gb/s ports, Dual Intel Gigabit Networks, native USB 3.0 support, M.2 support, and Creative Core3D Audio with dedicated shielding and a separate audio ground. Of course, no great motherboard can truly flex its muscles without a great BIOS. The EVGA X99 Classified uses EVGA's new GUI BIOS that focuses on the best overclocking support and functionality. Straight and to the point, the way a modern BIOS should be.